Joe Burns is a prominent international activist and critic of Western Child Protection Services (CPS) from the Republic of Ireland. Over the last decade, Joe Burns has helped numerous innocent families, including Indian ones, facing persecution by European CPS agencies, providing them with moral support, advice on how to regain their children, helping wrongly accused parents to get media attention and organising protests on their behalf. He has also written an informative book on this issue called Secret Courts – Child Protection or Child Abuse? He also maintains a blog called ‘Secret Courts Blog’ and Facebook pages called Alliance of Parents Against the State and ‘Secret Courts Book’ on this issue. Like many activists in the worldwide resistance against CPS atrocities, Joe Burns has come to this field not as a professional but out of compassion and concern for the suffering he has witnessed of families torn apart by CPS. In fact, it is the professionals in sociology, psychology, social work and children’s NGOs who are, sadly, the greatest defenders of this horrendous system – a system that Joe Burns warns India not to adopt. A version of this article was first published on 9 December 2017 in the Sunday Guardian with the title Don’t look at the West for lessons on child protection as part of our ongoing weekly series with them called Global Child Rights and Wrongs. This is not to say that there are no children in need of protection in India. Such problems exist in every country in the world. The question is: ‘Should India adopt the Western ideology of Child Protection for protecting Indian children?’. My advice is absolutely not. Is India Losing its Innocence? When I say “innocence” I don’t mean it in any disrespectful way. India is an amazing country and a powerful nation. But it has certain charms about it that are refreshing to Westerners, even though the culture has now become more “westernized” in some aspects. I believe there are certain aspects of Indian culture that the West should be envious of, and certain aspects of Western life that should not be emulated in India. I visited India in 2006 for a friend’s marriage. Over the years I have had, and still have, many Indian friends who have emigrated to Western countries where I have lived. Before I visited India, I read as much as I could, but nothing prepared me for what I saw! More people should visit India. I have to be honest and say I could never adjust to Indian food. And I think that Indian drivers are some of the craziest people I have ever seen on the roads. But I met the most beautiful people I have ever met anywhere in the world. The first thing that struck me, once I had recovered from the flight to Mumbai, was how Indian culture values the family. My friend’s family had one car, and it was shared with everyone. The grandmother had an important role in raising the children. I have met many Indian grandparents coming to Ireland and taking an active role in raising the children. In India family is sacrosanct, it is an institution not to be interfered with. And the role that Indian mothers and grandmothers play is to be greatly admired. Men have to take a back-seat on certain matters and the role that women play in Indian culture is equal to men. Thousands of years of human evolution in any culture has developed the family as the ultimate “Child Protection System”….It’s important to realize that this is instinct and not “culture” or “religious ideology”. The vast majority of children are very well protected by family and communities. Thousands of years of human evolution in any culture has developed the family as the ultimate “Child Protection System”. As adults we have an instinct to see children as more vulnerable than adults. Even children have an instinct to look after babies and more vulnerable children. We have even seen this in the animal kingdom where wild animals will protect other young animals or even children where they would normally prey on them. It’s important to realize that this is instinct and not “culture” or “religious ideology”. The vast majority of children are very well protected by family and communities. This is as Nature intended and we do not need to be taught this. 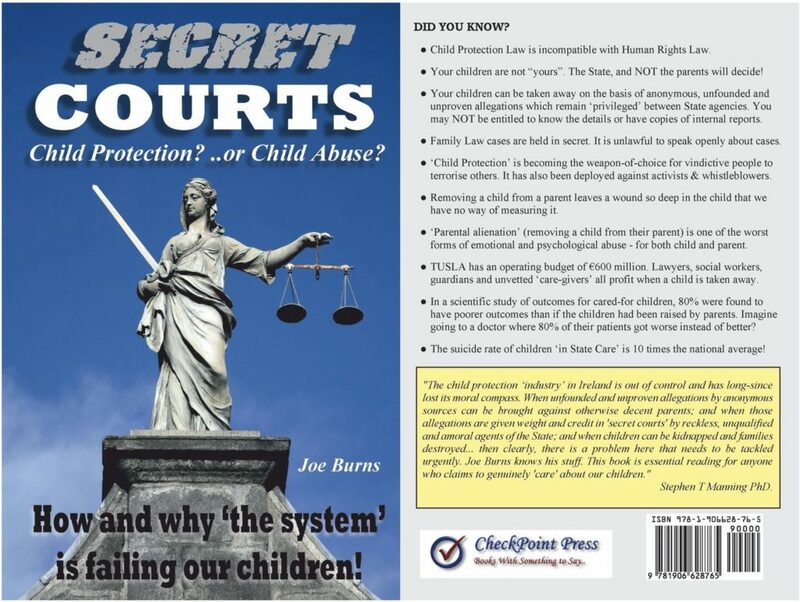 Joe Burns’ book on the dysfunctional system that is abusing children in the name of “child protection”. I should also say that I have no academic qualifications in this field, my qualifications are in the area of Engineering and I have worked most of my life as a problem solver. My book is based on my experience of a decade of helping families against the Governments who removed their children from their care. I am not opposed to protecting children. Of course, some children are abused or neglected by parents and care-givers, but I am strongly opposed to government interference in family life. In my experience, there is no situation so dire as cannot be compounded by government intervention. The State is the worst possible parent, this is strongly supported by the evidence, especially in the Western world (cf. ‘Child Protection and Child Outcomes: Measuring the Effects of Foster Care’ by Joseph J. Doyle Jr., 2007, American Economic Review, 97(5):1583-1610, which finds that “children assigned to investigators with higher removal rates are more likely to be placed in foster care themselves, and they have higher delinquency rates, teen birth rates, and lower earnings. Large marginal treatment effect estimates suggest caution in the interpretation, but the results suggest that children on the margin of placement tend to have better outcomes when they remain at home, especially for older children.”). Although the people involved in Child Protection have the best intentions and the “best interests” of the child at heart, any scrutiny of their efforts show they are failing these children miserably. For instance, an Independent Child Death Review Group which looked at children who died while in contact with Irish state services between 2000 and 2010 showed that the suicide rate among such children was 10 times the average. I have a dire warning for the people of India: In recent years I have seen the ideology of Western Child Protection starting to take a foot-hold in India. A decade ago in India, Sociology and Social Work did not play a strong role in Indian society. I can see the evidence that these Western ideologies are starting to gain popularity in India. I would especially warn people to be cautious of the agendas and lobbying of children’s non-governmental organisations (NGOs) posing as “Charities”. I believe some politicians will be led to support the NGOs and will try to push the agenda of emulating the worst excesses of the Western system of Child “Protection”, and eventually start an “Industry” around it. Believe me when I say, the West has nothing to teach India on the topic of Family or Child Protection. As many Indian citizens have learned in the Western world, you can lose your child forever on the whim of a government official. Ireland, the UK, Norway, the USA and Canada have nothing to teach India about the protection of children, as they are the worst possible examples of abusing children in the name of child protection. This is not to say that there are no children in need of protection in India. Such problems exist in every country in the world. The question is: “Should India adopt the Western ideology of Child Protection for protecting Indian children?”. My advice is absolutely not. To understand the problems with Western Child Protection, you need to understand the ideology of Social Work and Sociology. At its core, these disciplines hold the opinion that: Family is an outdated concept with its vestiges in our tribal roots. This understanding of the family, which has its roots in eugenics, is very much at odds with Nature. Eugenics has been around for centuries, but became popular in the early 1900’s. Eugenics was rejected after the Nazis in Germany used it for their Lebensborn Program [a state-sponsored program in Nazi Germany for promoting the birth of “Aryan” children so identified on the basis of Nazi theories of racial purity]. It was believed that human conditions could be “bred” out of society in the same way that animals are bred to a specific purpose. Ofcourse, nothing was known at the time about DNA or genetics. It was thought that preventing poor people from having babies would eliminate poverty. In the Western ideology of Child Protection, children are removed from parents and placed with strangers. The vast majority of children are removed only on the basis of “Future Risk of Emotional Abuse”. The children are then placed in absolute danger in State “care”. In 80% of cases these children will have poor outcomes in life. (see, for instance, Joseph J. Doyle Jr.’s paper referred to above). But let’s not forget the people involved are doing this with the best of intentions. While these “protectors” of children get a rush of adrenalin and good feelings from removing babies at birth, what happens to those children later is that they are left far worse off for the intervention. India has an opportunity to develop a World-Class System of Child Protection. I would urge people not to follow the example of the West. I could go into great detail but I have already covered everything in my book. I would urge people not to accept my word, but to do their own research on this. The Child Protection System of India is about to evolve, just as it is in other countries. India has an opportunity to develop a World-Class System of Child Protection. I would urge people not to follow the example of the West. I would especially urge people not to allow a separate system of justice in establishing Family Courts. To have a situation, as we do in the West, where you are innocent in the criminal justice system, and yet you are punished with the removal of your children in the Family Courts, is incompatible with Human Rights. That is not to say that Sociology and Psychology, on which Sociology is based, has no value. A skilled Psychologist can intervene and save a person’s life. A skilled Social Worker, if only allowed to act as an Advocate and not as a Prosecutor of families, can intervene and have a positive effect. In the West we wrongly believe that Social Workers Advocate first, and then Prosecute if necessary. In reality, because social workers are working with such flawed guidelines, by default they want to remove every child to “save” the child. If the Western ideology of Child Protection takes a hold in India, its people will suffer. For India to lose its culture of family would be a disaster. While some ideologies can benefit another culture, the West would benefit from emulating Indian culture. The family is the most basic unit of society, and the most important. If India does not recognize and learn from the mistakes of other cultures, then India is doomed to repeat them. Joe Burns is an engineer by profession. He is a passionate activist against wrongful child snatching by Western child protection authorities, with a number of publications and blogs on this issue. He is from Ireland.